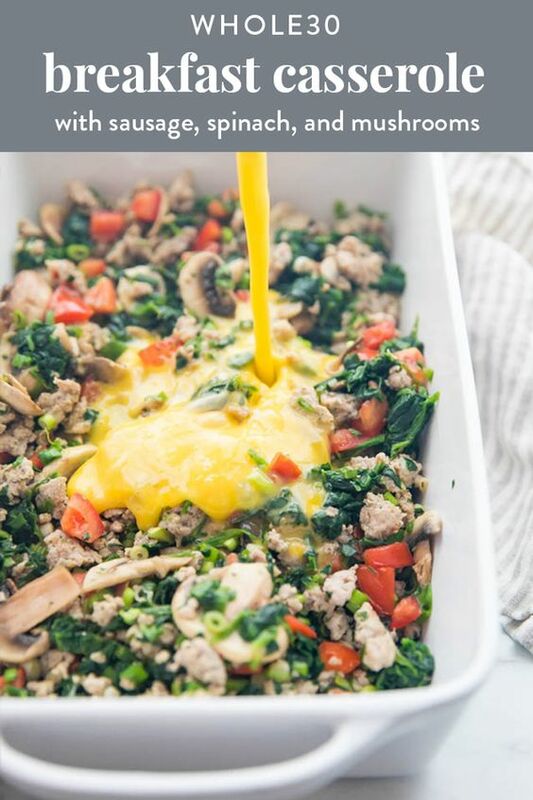 This Whole30 breakfast casserole with sausage, eggs, spinach, and mushrooms is flavorful enough to live off of during a Whole30. You’ll love this healthy, paleo breakfast because it’s packed with flavor, protein, and fiber, making you feel a-freaking-mazing all day. Combine all ingredients in a medium bowl and mix well with your hands. Use in recipe right away or keep in an airtight container for 1 day in the fridge. In a medium skillet over medium heat, brown and crumble sausage. Add olive oil if necessary. Add mushrooms and cook about 5 minutes or until soft, stirring occasionally. Add remaining vegetables, herbs, and salt and cook about 2 minutes or until slightly softened and well combined. Pour mixture into a 9x13" pan. Crack eggs into a medium bowl and whisk well. Pour over sausage-vegetable mixture and bake 25-30 minutes or until a knife, inserted in the center, comes out clean. 0 Response to "Whole30 Breakfast Casserole with Sausage, Eggs, Spinach, and Mushrooms (Keto)"